Brad’s Kitchen brings the pizza party right to you. Our mobile oven creates a different twist to anniversaries, bar/bat mitzvahs, family reunions, corporate picnics, holiday parties, golf tournaments, school fundraisers and so much more. You name it, we’ll do it. We use the freshest ingredients to create a variety of sizzling hot Neapolitan-style soft thin pizzas, with a chewy crispy edge. The warm aroma of homemade pizza fills the air from our piping hot mobile oven. 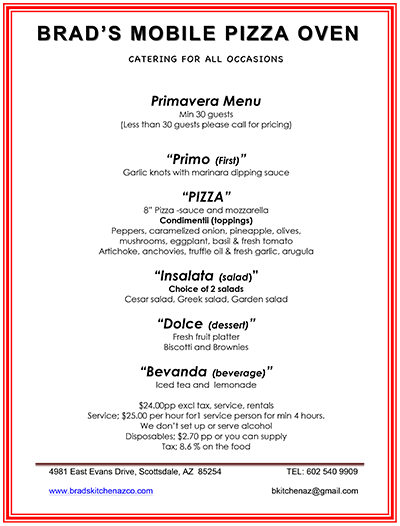 See some sample menus below. 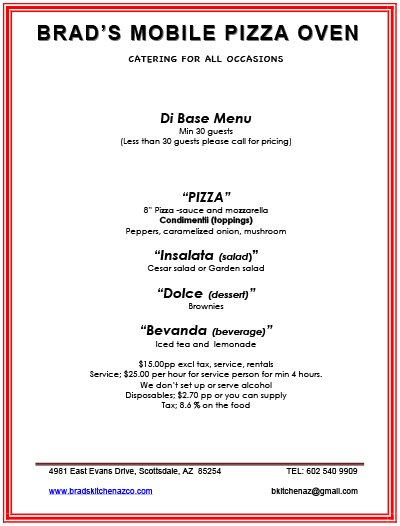 We are happy to customize a menu to suit your experience. Call us to schedule your unique pizza party experience.